After years of struggling to attract investment, downtown Oakland is enjoying a renaissance. Organic, bottom-up growth and targeted public investment are resulting in new cultural events, art galleries, restaurants, bars and retail stores. The population and job base are growing, companies are relocating or expanding downtown and commercial vacancies are declining. Oakland’s urban center is poised to take on a more important role in the region — but the future is not guaranteed. An economic boom could stall before it really gets going. Jobs and housing could expand elsewhere, leaving downtown Oakland underutilized. Or the economy could really take off — but in a way that harms Oakland’s character, particularly its cultural dynamism, racial and ethnic diversity, political activism and identity as a welcoming community. 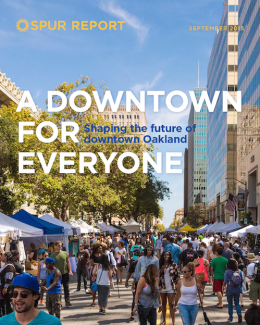 We believe that the best path forward is to plan for growth — and to shape that growth to make downtown Oakland a great place that provides benefits to all. Downtown Oakland is an opportunity to demonstrate that equity and economic growth can go hand in hand. We propose five big ideas for how downtown can grow to better serve Oakland and its residents.